With age, a influence of the terroir increases gradually. The vintage character decreases as acids become softer and sugar become integrated with age. If the producer is skilful - as is Beyer - and has kept the yields low and fermented slowly, time will allow the terroir to be come on display. 2002 Riesling Réserve from Léon Beyer in Eguisheim is medium golden. 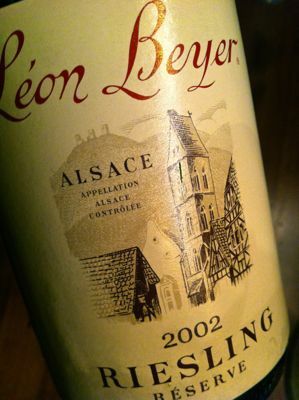 The bouquet is complex with hazelnuts, warm peaches and the typical, earthy hallmark aromas of Eguisheim. The flavour has gained surprising body and fruit, impeachable balance and a fresh and crisp aftertaste. Wonderful!